Rate the slot! To add a rating, you need to login. 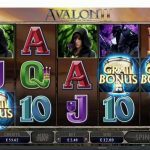 Microgaming had plenty of success with its first Avalon slot so it is no surprise that it would go about and create a second slot. 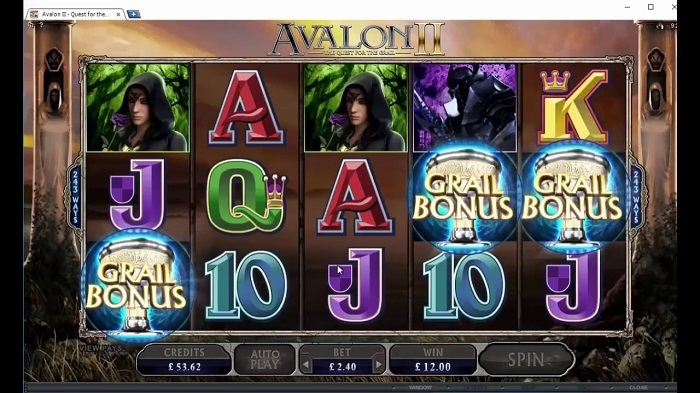 This Avalon II slot review shows that this game has a number of big payout points that make it stand out a little more while having a special way for players to win something huge and worthwhile for any desires one holds. This video slot from Microgaming was designed with an organization that is somewhat similar to what the original one in the series has. It has a similar theme in that it focuses on King Arthur and his many knights of the round table. The game has more of a realistic look to it as it features some of the many wizarding features of the Arthurian legends. It has many kings and queens and numerous warriors and mages all around. The majesty and magic of the time can be found all around the game as it adds a fun look all the way through. A big point to find on this Avalon II slot review involves the great setup that comes on the screen. Microgaming has made it very easy for people to get a good control running here. The game has five reels plus 243 ways to win. Coins can go from 1.5 to 7.5 in value on each. The control system on the screen makes it easy for a player to adjust the value of each coin. This is not going to change the odds for winning something but it does give off a bigger payout when one is actually successful while playing. The game logo is the most valuable symbols although the ones with Arthur, Merlin and Guinevere are the most prominent ones to look for while playing here. This all offers a good organization that is fun to go along with and offers a strong setup all the way through. Like with many other Microgaming machines, the game logo also happens to be wild. During the regular game, there are two particular bonuses that can appear at random. 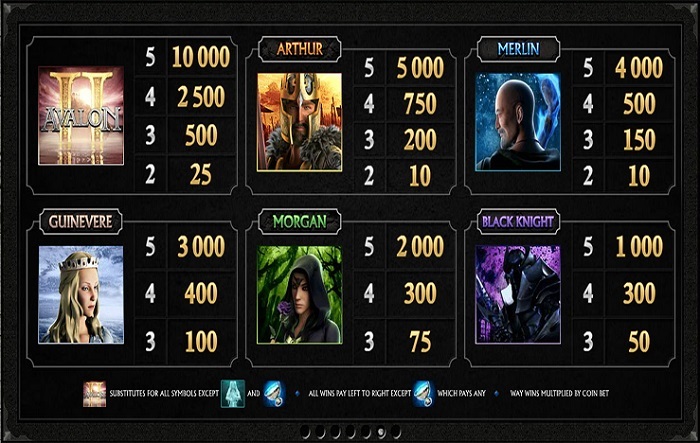 The first is the Merlin bonus where a random multiplier is added. The expanding wild point is the second as it appears at random. This adds to the symbols that are wild although it is more likely to happen on the middle reel above all others. But the best bonuses come about when three or more grail symbols show up. This results in one of eight different bonus games coming about at a time. 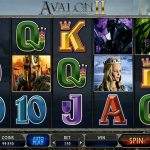 The particular bonuses that will appear are relatively varied but the great part of this Avalon II slot review is that it is one game that offers a good setup for anyone to play with. The Lake of Legend works in that the player has to restore the Excalibur sword by finding a series of fragments on a screen. The payouts here are greater when more parts of the sword are applied at a time. The Misty Value offers fifteen free spins and the option to choose a particular symbol to become wild. 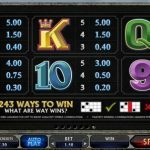 The chances for big payouts can vary based on the symbol that is chosen but it does offer a good way to win more if chosen well. The Forest Falls feature offers 20 free spins with a series of sticking wilds. The Morgan’s Keep feature also has 20 free turns while the reels will roll after each win. This works in that any non-winning symbols will be re-spun after the winning ones are properly calculated. This adds to the chances for a player to get a better total payout all the way through. The Isle of Avalon reveals a special wheel. It gives out a particular payout or series of turns depending on where it lands. The random nature of these bonuses makes for something very intriguing. 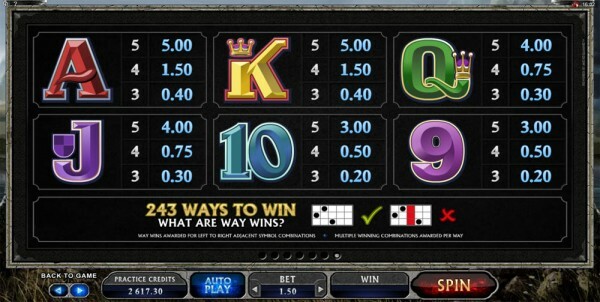 Those who get more bonuses during a single play session are more likely to get into some of the more valuable options. This encourages people to stick around and keep on playing in the hopes of getting something really worth looking into. Players around this machine are capable of getting some huge payouts. Specifically, the top payout is good for 120,000 coins. In terms of the basic symbols, the game logo gives out 500 coins when five of them appear on a line. Five Arthur symbols in a row will produce 250 coins. 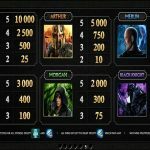 Merlin and Guinevere also produce good payouts although there is a better chance that some really good totals will come about during the free spin portion of the game. This is where all the good multipliers and other strong bonus points can be found all around the entire game. This newer game is a little more advanced than the first Avalon one in a variety of ways. The graphics for the second one are clearly a little more advanced and photo-realistic in terms of how they are laid out. Meanwhile, the extra bonus points around the game make it a little more interesting in terms of how it is all promoted and highlighted. 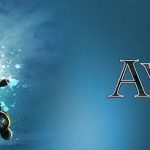 But one point is for certain in that this is a true evolution in terms of the how the Avalon universe is being highlighted. 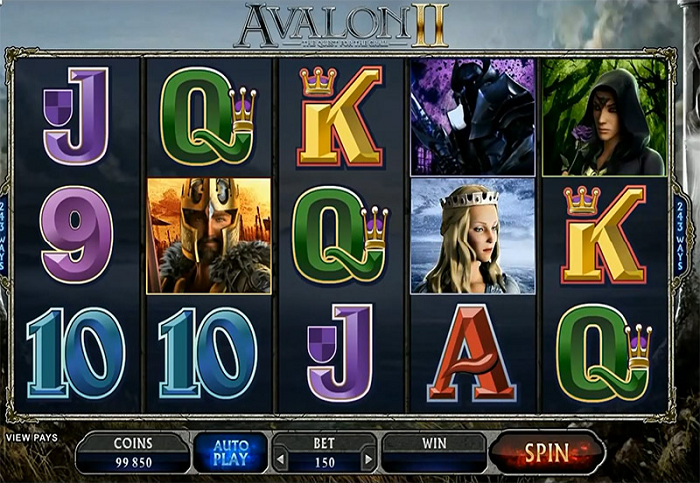 This Avalon II slot review certainly shows that this is a particularly fun game that gives off a good look all the way through. People looking for a fun video slot to see should look at what Microgaming has done here as this game has an outstanding look all the way through that offers a great way for anyone to win something huge. 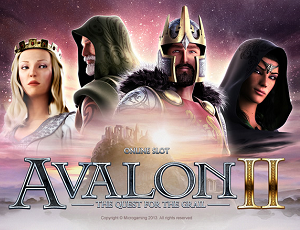 Check out the Avalon II slot at most online casinos that work with Microgaming software.